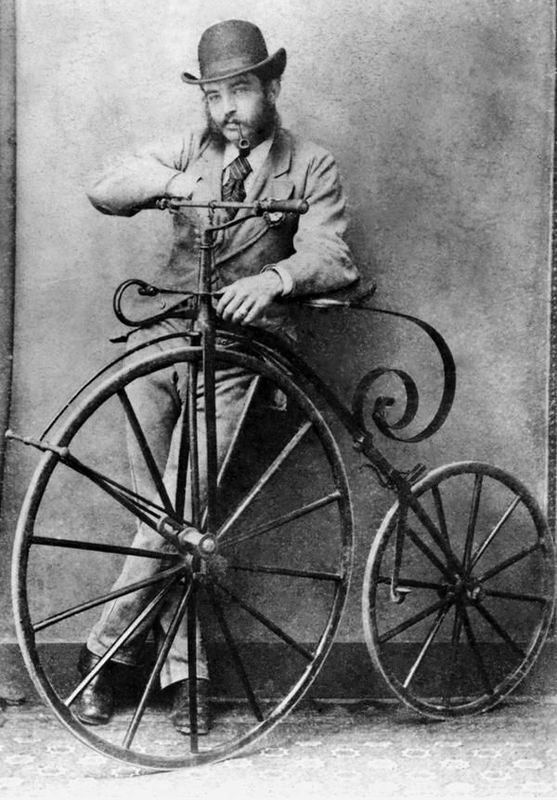 The prototypical Dandy bicyclist, circa 1869, with a Michaux pedal-cycle of the first type. 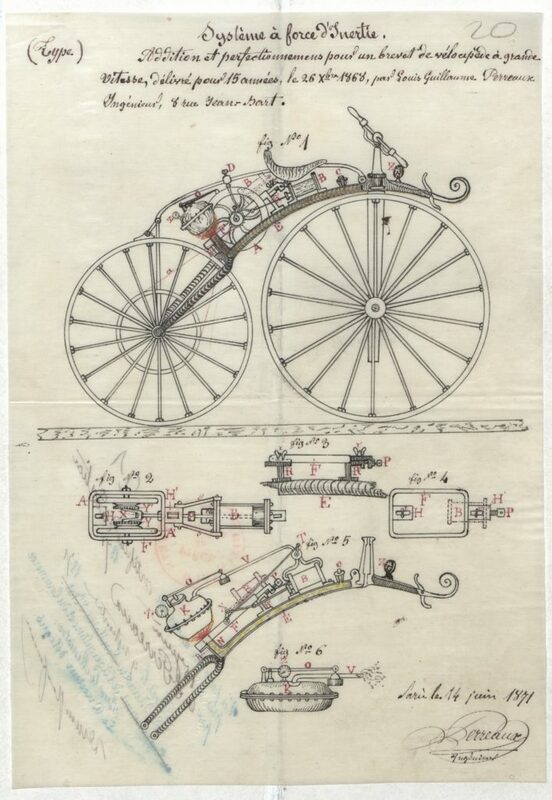 Note also the delicate footrests above the front wheel for coasting, and the elaborate brake pedal operating the ‘spoon’ brake pad on the rear wheel. The pedals are connected directly to the front axle, so speed and effort is related to the wheel diameter. As pneumatic tires would not be invented for 20 years, the steel rims of these bicycles gave rise to the ‘boneshaker’ nickname, although the tempered steel spring holding the saddle would have relieved many of the shocks on the unmade roads of the day. The first velocipedes were also called ‘Dandy Horses’, as young men were their most enthusiastic adherents, much as the author of this article from 1869. Picture this fellow as our author, who sadly remains unnamed. I am not ashamed to admit having always cherished a peculiar admiration, at one time amounting to awe, for anything that would go round. A wheel has never been without its charm for me. I remember, at school, the affection with which I regarded wheels of all sorts, and how all my favourite toys as a child were rotary ones. The knife-grinder who used periodically to stop in front of our play-ground gates to grind the young gentlemen’s knives, has probably died without knowing the inward comfort he administered to my breast, through the opportunities he afforded me of seeing his wheel go round at public expense. Only the other day, I confided to an old friend that I still possessed a sneaking regard for wheels, and though he rewarded my confidence with a pitiful sneer, I know that this wretched old hypocrite himself keeps a wonderful brass top that will spin for an hour, under a glass case on his study-table, and in secret delights to watch it in motion. A clever marine engineer, who loves wheels too, once told me with great gravity that the human mind has never yet discovered anything so wonderful as the principle of the common wheelbarrow, ‘an invention,’ he said, ‘to which that of the steam-engine itself is nothing. The wheelbarrow,’ he went on, ‘is the only example I am acquainted with in which the very weight of a load is fairly utilised as a locomotive power.’ There was a copy of Punch on my table. Our conversation had turned to the subject of wheelbarrows from looking at Mr Keene’s vignette, in which, some three years ago, Mr Punch was depicted as Blondin, but performing the impossible feat of wheeling himself in a wheelbarrow along a tight-rope in the Crystal Palace transept. My engineer friend then remarked that, putting aside the tight-rope business, he was firmly convinced that Mr Keene had in jest represented what would by-and-by be accepted in serious earnest as the only correct principle on which to construct a self-driven vehicle – namely, employing the weight of the body as a propelling power, and relying on the fact of motion as the means of balance. One thing will at least be conceded by any person who will take the trouble to turn to the sketch, and that is, notwithstanding all recognised notions and experience to the contrary, the picture of a man driving himself in a wheelbarrow looks strangely plausible, probably from the fact, that the mind of the observer communicates motion to the wheel, and is satisfied to receive that as the explanation of the balance. 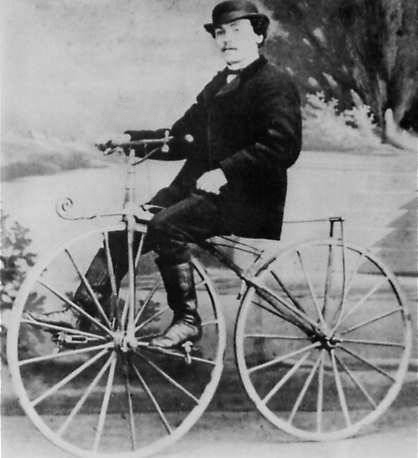 The two-wheeled velocipede or bicycle is in part a realisation of Mr Keene’s picture. It depends upon motion for its balance. The two wheels, one in front of the other, with a saddle between, whether mounted by a rider or not, will not stand upright for a single instant at rest; but, like the boy’s hoop, being kept trolling, they maintain a perfect equilibrium. The bicycle can hardly be called a ‘new invention,’ being to a great extent a modification of that very old toy-vehicle of our fathers, the hobby-horse, whereon the rider used to sit and row himself along, so to speak, by paddling with his feet on the ground; at the same time, the entire reliance on the principle that motion would be, under any circumstances, sufficient to produce balance, is sufficiently novel almost to justify the use of such a term. The French appear to be entitled to whatever of credit attaches to the original invention of the hobby-horse (a miserable steed at best, which wore out the toes of a pair of boots at every journey. M. Blanchard, the celebrated aeronaut, and M. Masurier conjointly manufactured the first of these machines in 1779, which was then described as ‘a wonder which drove all Paris mad.’ The French are probably justified, moreover, in claiming as their own the development of this crude invention into the present velocipede, for, in 1862, a M. Riviere, a French subject, residing in England, deposited in the British Patent Office a minute specification of a machine identical with that now in use. His description was, however, unaccompanied by any drawing or sketch, and he seems to have taken no further steps in the matter than to register a theory which he never carried into practice. 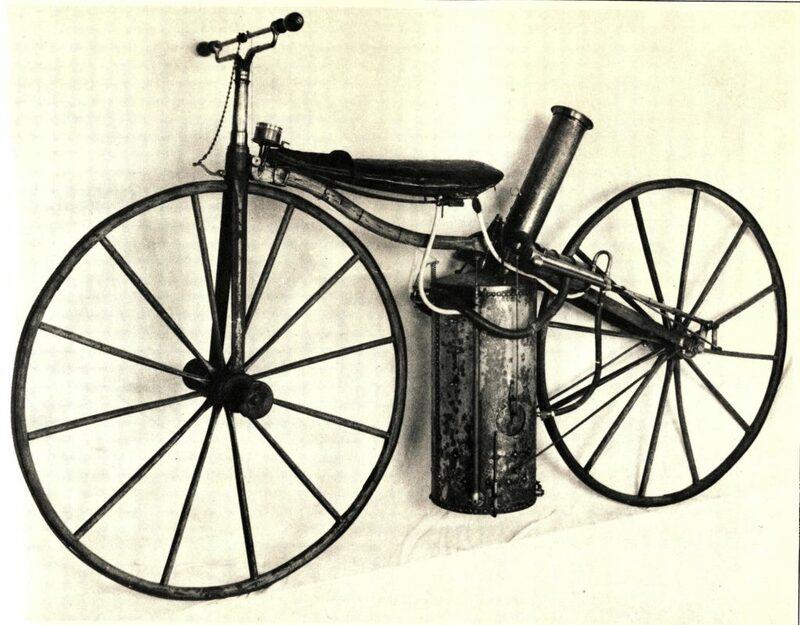 Subsequently, the bicycle was re-invented by the French and by the Americans almost simultaneously, and indeed, both nations claim priority in introducing it. It came into public notoriety at the last French International Exhibition, from which time the rage for them has gradually developed itself, until in this present 1869, it may be said, much as it was a century ago, that Paris has again been driven mad on velocipedes. 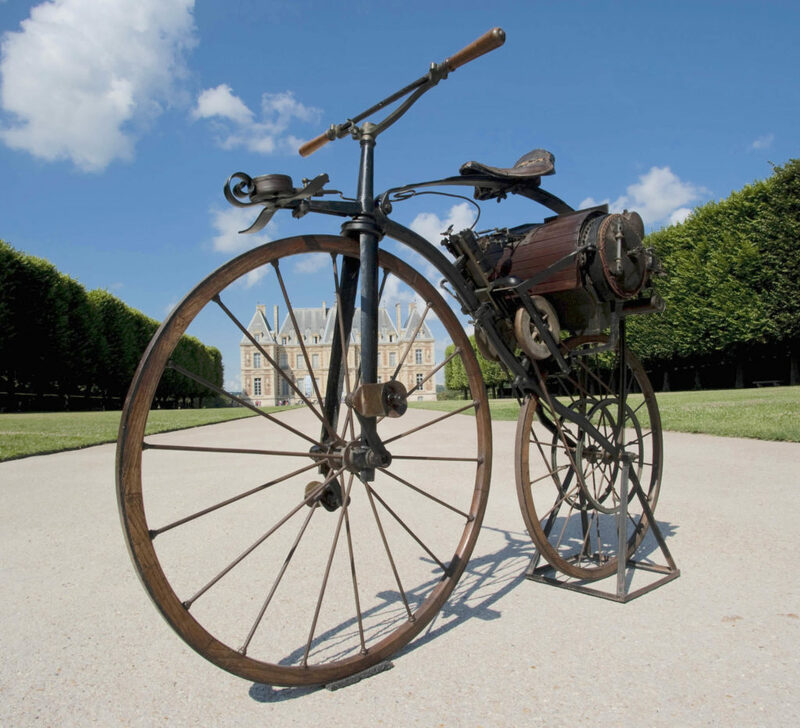 Extensive foundries are now established in Paris for the sole purpose of supplying the iron-work, while some scores of large manufactories are taxing their utmost resources to meet the daily increasing demand for these vehicles. The prices of good serviceable velocipedes range from two hundred and fifty to four hundred francs (ten to sixteen pounds), at a less price than which a really good machine cannot be obtained either in England or France. The best French pattern is that of Michaux et Cie., which is the one now adopted by most of the English builders with more or less correctness. The height of the driving-wheel most suitable for general use is three feet. The advantages of the bicycle over the three and four wheeled velocipedes are many and considerable. It is less than half the weight of the old machine, being but a little over forty pounds; and the friction is reduced to something like two-thirds. The power operating directly on the cranks, instead of being communicated through long levers, is wholly utilised, whilst the motion of the feet is more analogous to that of walking. When once accustomed to the use of the two-wheeled velocipede, it is not at all fatiguing, whereas the many-wheelers condemn their riders to a term of hard labour. As the result of several months’ experience in driving a bicycle, I have no hesitation in estimating it as a clear gain of five to one in comparison with walking. That is to say, the rider may go five miles with the same expenditure of labour as in walking one, and after a journey of fifty miles he will feel no more fatigue than after having walked ten. Notwithstanding appearances to the contrary to the unaccustomed eye, the bicycle is, moreover, a safer machine than any velocipede with three wheels, and far more under control. 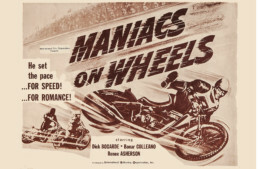 To turn a corner with a three-wheeler at anything like speed, is a most hazardous experiment, resulting almost certainly in a ‘spill’ – because the speed lifts the hind-wheel describing the outermost circle, from the ground; whereas the two-wheeler, when on the turn, stands at an inclination like a skater’s body, more or less acute according to the quickness of the curve to be described. The two-wheeler, when on the turn, stands at an inclination like a skater’s body. With regard to the speed which may be attained, fifteen miles an hour, under the most favourable circumstances, that is, good hard road, not level, but without very steep hills, and no wind blowing, is probably the limit of the velocipede’s powers; but a pace of nine or ten miles an hour may be maintained for five or six hours without distress. Long journeys on level road are perhaps the most fatiguing, on account of their monotony, because then the feet, as in walking, are nearly always at work. Still, even in this case, the driver can maintain his speed with one foot, resting the other on the leg-rest; or, if disposed, he may even place both feet on the rests, and run four or five hundred yards without working at all. The slightly increased labour of climbing a hill is nothing to the zest imparted by a knowledge that there is sure to be a hill the other side to go down, and that is the most luxurious travelling that can be imagined. Descending an incline at full speed, balanced on a beautifully tempered steel spring that takes every jolt from the road – wheels spinning over the ground so lightly they scarce seem to touch it – the driver’s legs rested comfortably on the cross-bar in front – shooting the hill at a speed of thirty or forty miles an hour – the sensation is only comparable to that of flying, and is worth all the pains it costs in learning to experience it. The sensation is only comparable to that of flying. The velocipedist feels but one pang when he reaches the bottom of a hill, and that is, that it is over; and but one exquisite wish, which is, that the entire country might somehow become metamorphosed into down-hill. But the hill is bountiful even after one has left it, for the impetus derived from a good incline will carry the rider at least the hill’s length on level ground before he need remove his feet from the rests and commence working again. The slightest incline on a good road is sufficient to obviate all necessity for working with the feet, so that what little labour there is (and it is of the easiest), is by no means incessant. In a journey of twenty miles on good road, a driver should not work more than twelve – the inclines do the rest. Of course, there are hills so steep that to ascend them is impossible: yet, for myself, living in a hilly county, which I have pretty well explored on my two-wheeled steed, I can reckon up their number on the fingers of one hand. There are also hills where the labour becomes as much as, or more than, walking, but these must be of a gradient something like one in twelve, and such hills are not frequent. When they do occur, the rider may, if he will, dismount. It is a subject of smiling pity to many of the uninitiated to behold a velocipedist dragging his horse after him up a hill – and cruelly realised, too, in the case of three and four wheeled machines; but the bicycle is better than any walking-stick to assist a person up an incline, even when only walking beside it. Resting one elbow on the saddle, and leaning the weight of the body on that, while guiding the handle with the other hand, the machine becomes a positive assistance instead of an incumbrance. This sounds like fiction, but it is fact. Experto crede. 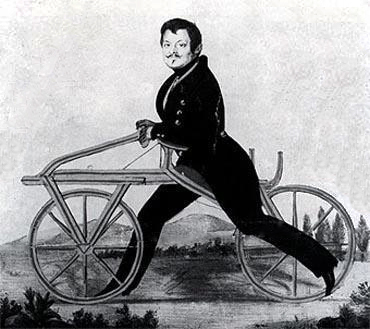 There are persons who advertise to teach the use of the velocipede in ‘a few hours.’ Not long ago an enterprising French master advertised to teach the French language (in the intervals of seasickness) during the voyage from Dover to Calais. It should not be concealed that it requires as much time to learn the use of the bicycle as to learn to skate – and there are also occasional falls incidental to learning either. To urge the time necessary to acquire its use as an objection against the two-wheeled steed, would, however, be manifestly unjust. So difficult is it to balance the human body on merely two small legs and a pair of feet, in an upright position (a position such as would be scarcely possible to make an exact model of a man, even without life, retain for a single instant), that it has taken most of us a twelve-month to learn how to do that. It is sufficient to say that a person may attain the management of a two-wheeled steed in less time than that of a four-footed one, and when he has done so, for speed, endurance, and inexpensiveness, the former will at least bear favourable comparison with the latter. As in skating, a week’s steady and persevering practice is needful to acquire a comfortable balance, and gain control over the unaccustomed form of support. The ‘falls’ referred to above, as happening in learning the velocipede, are nothing to those incurred in learning to skate. No one should mount a bicycle until he is acquainted with the way to get off, which is really the first lesson. Whichever way the machine is going to fall, the learner has only to put out his foot on that side. His foot being not more than three inches from the ground, the horse, in the act of falling, will deliver him safe on terra firma, if he will only let it, whilst, by retaining his grasp of the handles, the rider at once balances himself on alighting, and saves the velocipede from falling. Some difficulty in remounting without help is sure to be experienced by a learner. For a month he must content himself with the assistance of the first post or gate or palings he sees by the wayside; but he will soon discard such assistance, and be able to vault on the saddle whilst his horse is in motion. Good hard road is essential for velocipede-driving. In muddy or loose gravelly road, the work becomes proportionately laborious. But with good ‘going ground,’ it is difficult to convey how little labour is really required to maintain a high rate of speed – in fact, the great trouble with beginners is to get them to restrain the expenditure of muscular force. 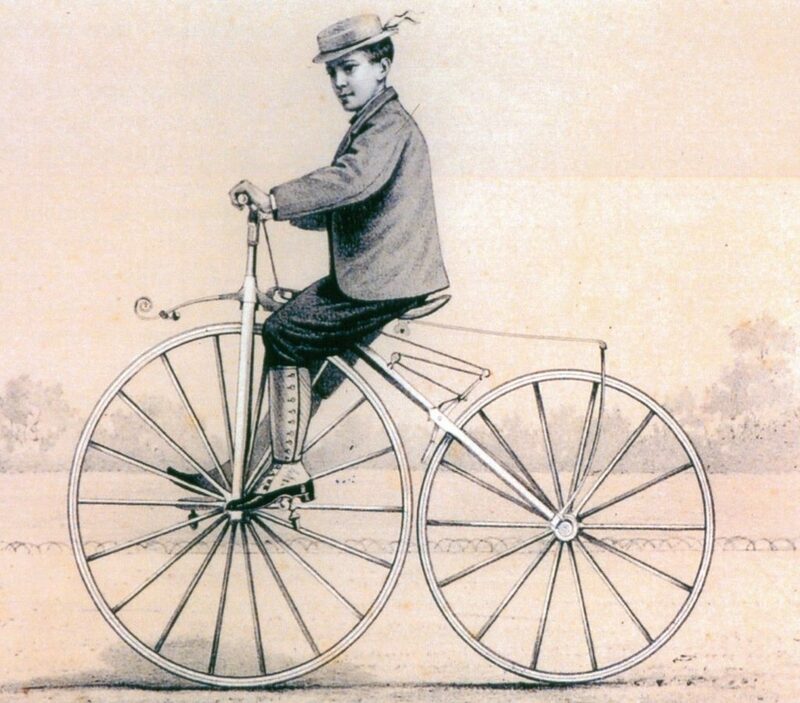 Velocipede-driving is, I believe from experience, most healthy and exhilarating, since it exercises all the muscles of the limbs in a manner much more uniform than would at first be credited, and certainly without undue strain on any part of the body. 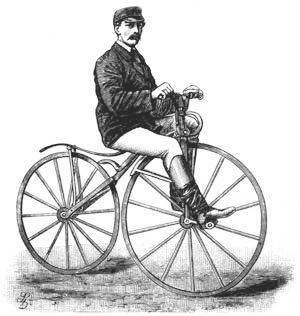 To the spectator, the velocipedist appears almost wholly to employ his legs, but in reality the muscles of the arms are in strong tension in the act of grasping the handles, so as to counteract the motion of the feet on the pedals, which motion would otherwise tend to sway the wheel from side to side. In fact, after a long journey, the driver will feel more fatigue in his arms than in his legs. Once mastered, the two-wheeled steed is a docile and tractable animal, equally sensitive to bit and bridle, and a sturdy friend to the traveller. For him the pike-men throw open their gates without asking for toll. He needs neither corn nor beans, nor hay nor straw, neither hostler nor stableman. His stable is a bit of the passage-wall, against which he reposes, without taking up any room, until his master needs him again – his only food, a pennyworth of neat’s-foot oil per month. There is a Japanese sauce surnamed the ‘Maker to Eat.’ It will have little charm to the palate of him who drives a bicycle; for, be he the veriest epicure of the epicurean sort, he will, after a three hours’ run, possess an appetite to which the most homely bread and cheese appears dainty. At present, the bicycle is regarded, in England, very much in the light of a toy, and its practice as a pastime: not so in Paris and New York, where persons of all grades may be seen solemnly and seriously going to their daily business on two wheels. Though there are a few pretending to be …. 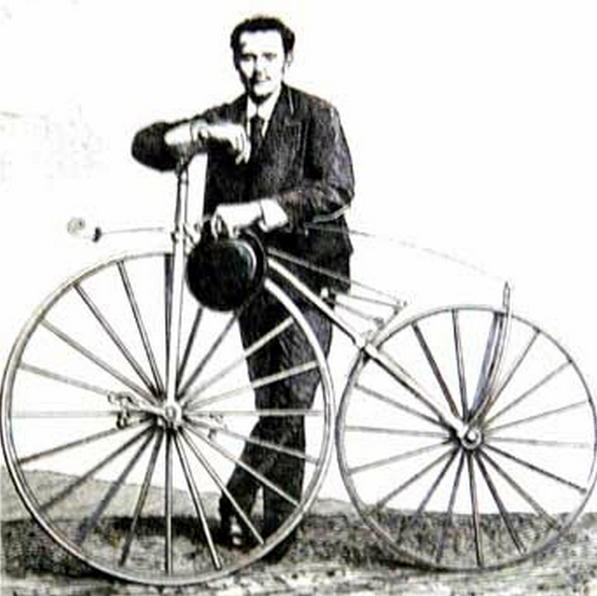 Somebody desperately needs to write a comprehensive history of the Bicycle including everything .. from Motorcycles to Airplanes to the Automobile that sprang from the ubiquitous ever present bicycle . That sounds more like a history of industrial design…which would be enormous. We’re slowly doing that on The Vintagent, though…and who knows, it might become a video project one day. Paul – Mea culpa . I guess I wasn’t clear enough about what I was thinking . Pierce! Reading-Standard! Indian! Rudge! Triumph! FN! Victoria! etc. A great idea, many thanks. The Velocipede Museum recently relocated from Delaware to Newburgh NY. They are now affiliated with the nearby Motorcyclepedia Museum. “Two-Wheeled Steeds” abound in this Orange County city on the Hudson River. History preserved for two wheeled transportation. Website link below and Velocipede has a Facebook page with regular postings. Thanks for your great work as The Vintagent!